– Educational Groups will be given tours at no cost. – Group Tours – $5 per person (minimum 10 participants). 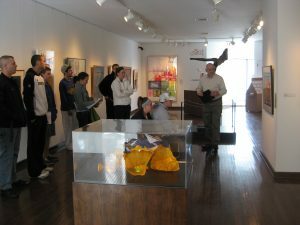 Guided group tours of the Museum and its exhibitions are provided by trained volunteer docents (gallery guides). Groups interested in taking tours, which can be tailored to the group, are asked to make arrangements at least two weeks in advance of the desired tour date. Please secure bus availability with your school or organization before making tour reservations. To make your arrangements for Bus Subsidies please fill out the form and drop it off or mail it to the museum. Introductory -Become aquainted with the museum’s permanent collection of American art and Bil Baird’s puppets. Brief visits to special exhibitions may be included. American Art -Gain an overview of the museum’s collection of 19th and 20th century American art including paintings, drawings, prints, sculpture, and ceramics. Historical background on American art and a variety of gallery activities can be included. Bil Baird “World of Puppets” -Journey into the imaginary world of master puppeteer Bil Baird, who grew up in Mason City. Many marionettes from famous productions are included, as well as puppets Baird collected from around the world. Films and videos produced by Baird are available for viewing with this tour. Special Exhibitions -View the current special exhibit in one of two galleries for temporary shows. Unique tour activities and materials may be available with some exhibits. Thematic -Select a theme that relates to a group’s interests or classroom curriculum. Works which exemplify that theme from other either the permanent collection or special exhibitions are then selected for the tour. Examples of themes are social commentary, basic art elements, portraiture, animals, landscapes, regional art, and Iowa artists. Tour leaders are welcome to generate other themes. Self-guided Group – Design your own tour of the museum’s galleries for your group. We do ask that you call ahead to make sure we are open and also so we can check that there are no events scheduled that could interfere with your enjoyment of the museum. Free to any group.